I made this card for yesterday's sketch challenge on Splitcoaststampers. The image is from Crafty Secrets 'Sweet Kids'. The card stock colors are white, Wild Wasabi, and Regal Rose. The designer paper is from DCWV Nana's Nursery 'Baby Girl'. The sentiment and hat are popped up on dimensionals. There are Stickles on the hearts. Ribbon and Adhesive Crystals were added for embellishment. Digital Tuesday Challenge #4 "April Showers Bring May Flowers"
Good Morning Everyone! Today I have some news to share with you. I was asked to be on the Digital Tuesdays Challenge Blog Design Team. Every Tuesday, a new challenge is issued using Digital Stamps and I am this week's hostess. If you've never heard of digital stamps before, they are FANTASTIC. Instead of using a rubber stamp, you 'buy' the image off the internet and download it to your computer. You just print the image out on card stock when you want to use it. The best part is that you can print the image to ANY SIZE YOU WANT! And, what a space saver if you don't have much crafting space to store rubber stamps. Its very inexpensive too! Most Digital Images only cost around $3.00 each! This week's challenge is 'April Showers Bring May Flowers'. 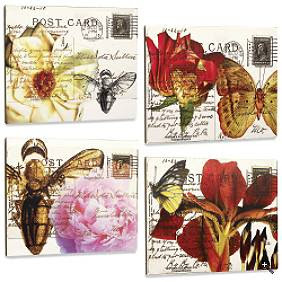 Simply create a card or project using digital images that have rain or flowers on it, or simply evokes a 'feeling' of a storm or a beautiful spring day. The winner will receive three free images of their choice from this week's sponsor Dustin Pike http://dustinpike.blogspot.com/. One lucky winner will be chosen by random next Tuesday. If you'd like to play along with this challenge, simply click on the Digital Tuesday Blinkie in my sidebar, and it will take you right to the blog. Here is the card I made for the challenge. I chose this GORGEOUS Digital Image by Digital Stamp Oasis called 'Susie Squirrel in the Rain". You can find her images by going clicking on the Digital Stamp Oasis Blinkie in my sidebar. For my card, I colored the image with Copic Markers. I printed the image out twice so I could cut out and mount up the daisy so it has a lot of dimension. There is a side view picture below so you can get a better idea of the what the dimension looks like in real life. The papers are all Stampin Up! : White, Barely Banana, Bashful Blue, Certainly Celery, and Bashful Blue Designer Paper. I mounted up both the main image panel, and the designer paper panel. The White panel was embossed with the Cuttlebug Swiss Dots Embossing Folder. Hi Everyone! I worked all weekend so I wasn't able to make anything new to show. Hopefully this afternoon I'll be able to get something done to post tomorrow. But I did want to post a Shout Out to Sheetload! 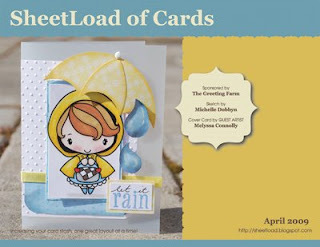 I know I've done this before, but for those of you who haven't checked out the April issue yet, you must head on over to http://sheetload.blogspot.com/2009/04/april-2009-sheetload-of-cards-sponsored.html and check it out! This month sketch is great and there are some great samples using Greeting Farm images. For those of you unfamiliar with Sheetload of Cards, every month they put out a FREE issue contain a sketch and the dimensions needed to make just one card or a Sheetload of them! There are also fabulous examples of cards made using that month's sketch. So what are you waiting for? Go ahead and check it out! I just popped in and visited a brand new blog called Crystal Crafts A-lot, isn't that a cute title? It would definately describe me! She is offering up some great blog candy right now too! To visit her blog go here: http://crystalk.bk.blogspot.com/. Have fun visiting, I know I did!